She is now the PRESIDENT of the Kittias Parent Group. Yeah, that just happened. We've finally finished our planting, although we'll continue to add to the garden as we harvest in a month in a half. As of right now, we've got a red pepper, green pepper, chocolate mint, pole beans, tomatoes, cilantro, peas, carrots, cucumbers, spinach, green beans, watermelon, raspberries and strawberries. That's in addition to our exploding Rainier cherry, apple and apricot trees and rhubarb. We've planted a bunch of annuals in the front yard and a bunch of sunflowers (mini and giant), fresias, ranunculas, tigridias, anemones and lillies. My guess is everything will either explode with color or our yard will go back to a "natural state" of crab grass, dandilions and noxious weeds. 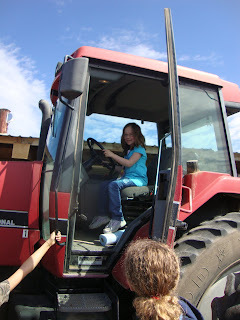 Daddy and Delaney explore the farm! This is Jon. Last week's torrential downpour certainly played havoc on our rivers and creeks, which led to plenty of flooding. Adelyn and I decided to head out and check out the local terrain. 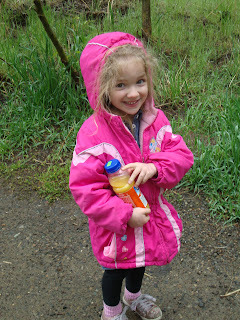 My little explorer, getting soaked in the rain. She didn't care one bit though. This is the boat launch (underneath the cresting river) at one of the parks in Ellensburg. About two hours later when we drove by again, the river had gone up probably another foot to overtake the entire parking lot and then some. Addy and I drove down the old canyon road to the Umptanum campground. We hiked around a little to get a bird's eye view of things. This is a foot bridge that leads to trails to a waterfall. We didn't make it much past the other side of the bridge as the trail was washed out. This bridge was rocking and had a pretty good shake to it, which didn't bother Addy Bear one bit. She was hanging over the side, running around it and giving her Dad a pretty good scare a few times. This is Jon. We had a pretty good Mother's Day until we all started getting sick, led by Addy. Brittany got her favorite breakfast (bacon and cinnamon rolls) and was greeted with gifts, flowers and art work from her girls. There's a new place in town called "Bounce Central" and the girls love it. We really like it because it's cheap and it's a great way to watch the girls play hard and crash later. Awesome. As you can see, Mommy got into the mix with the girls as well. Brittany's friend Holly and her daughter Abby visited as well. This is Jon. We've been in the backyard a lot lately, trying to shape our yard and garden as much as we can just to enjoy it as much as we can. Unfortunately, due to the plague going through our house, we've all been sick off an on for the last two weeks, but last week it seemed as though the grim reaper was in our living room. Needless to say, I put weeding and planting on the back burner and I'm paying for it this weekend, but it's been fun to get out there and clean things up. 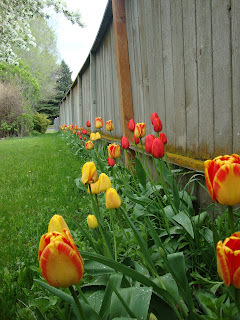 Our tulips, one of the first things we planted years ago before we even bought the house and were still renting. The last couple of years have been a bit bleak for the flowers, but this year they've seem to come back. The apple and cherry trees in full bloom. Last year wasn't good at all for either tree. The cold spring zapped the blooms and neither came out with much fruit. This year looks to be different.